Woodbury Town Hall is located at 271 Main Street South, Woodbury, CT 06798; phone: 203-263-2141. Photo: Glebe House, ca. 1746, 49 Hollow Road, Woodbury, CT. Listed on the National Register of Historic Places in 1971. Photographed by user:LisaHendricks (own work), 2013, [cc-by-3.0 (creativecommons.org/licenses/by/3.0)], via Wikimedia Commons, accessed January, 2018. 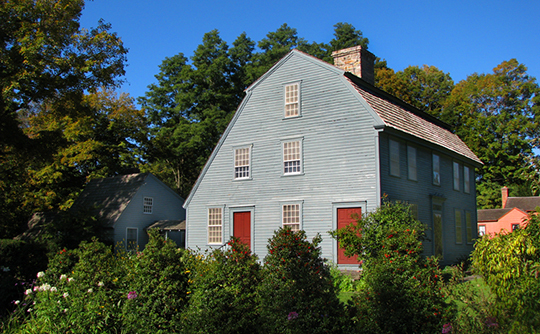 Woodbury was originally settled by white men in 1672 and chartered in 1674. Chief Pomperaug was the town's first proprietor and is believed to rest beneath a boulder on Main Street, where a tablet and a 'Private Property' sign were found as late as the 1930s. The quiet main street, shaded by giant maples and elms, was bordered by many beautiful houses of the Colonial period, in addition to 5 churches. Dairy farming provided practically all of the income enjoyed by Woodbury farmers in the early 1900s, but the summer residents furnished part-time employment for local labor not employed in agriculture. Woodbury contributed freely to the Revolution. Many members of Ethan Allen's force at Ticonderoga came from homes along the banks of the Pomperaug. In all, some 1,500 of Woodbury's sons served with the Continental Line and great stores of rations and funds came from this valley. Two noted Civil War generals, Grant and Sherman, traced their lineage to Woodbury families.